If you are looking for a retired UM pastor, now probably a Buddhist by most estimates, whose politics are left of progressive, you’ve found him. I didn’t ‘lose my faith;’ I set it at the curb. The book I’m shown autographing in my photo was an anthology by a writing group in Arkansas. A couple of my articles have appeared in the ‘Cenizo Jounal’. [www.cenizojournal.com] The ‘Cenizo’ articles were written while my wife, Jane, and I served at Big Bend National Park (Texas) as volunteers. We don’t travel like we once did. We are content now to spend most of our time in central Ohio. Jane likes fabric art, quilting, and I’m a hand-weaver. 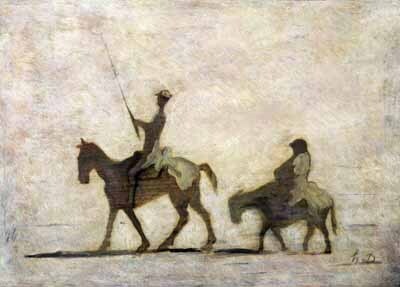 Like Don Quixote’s companion, I’ll try to exercise my wit, offer sage advice and join in tilting at a few windmills in this blog named for Sancho’s bon mots. Thank you so much for for dropping by my photography blog, thingsunderstood.wordpress.com and for following my work. I really appreciate your interest and support of my creative endeavors! Ron, thank you for following my blogs. It’s very nice to meet you. Hi Ron – I like your description of yourself. Hope all’s well on the road. Are you back in Big Bend yet? Thanks for following my blog. I appreciate it.